Recently I was told the reason God takes the little children, is because, They have secrets told to them from the Lord, that We are Never to behold. Most Pictures taken of Cheyenne, she has (1) finger in her mouth, Was this Cheyenne's "Secret" way of letting us know, "I have only ( 1 ) year to share with you." Every evening the Angels go for a walk, before they go, they each light a candle. There was one, called Heaven's little Angel, sitting there crying. Why, are you crying? She was asked , because I want to go for a walk with the Angels she replied, Then why do you not go? She was asked, I cannot go until I get my candle to stay lit, and everytime I light it, My Mommy's tears put it out. 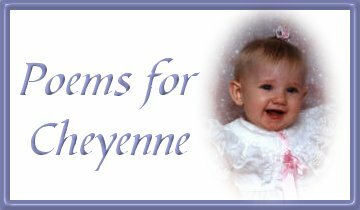 Light your Candle my precious Cheyenne Autumn, I will try to hold my tears, so that you may enjoy your walk with the Angels. Heaven is now where she lives, free and safe from harm. Young and Forever innocent, she'll Always be with you. Never will be forgotten, for you were my special bloom. Even though you are up high, and I am left to forever mourn. Until we meet in Heaven, and I hold my girl again. Up above in Heaven, watching over me with care. Now go and play, My Daughter, and enjoy Eternal Days. My memories shall keep me, and lift me when I fall. Heaven now awaits you love, And remember, Mommy Loves You Still. and decided to take you away. when they carried you on their wings that day. and leave me here on my own. so in my heart, I would never be alone. when He decided your time on earth was done. so you would be able to watch over everyone. and could make the world a greater place to live. and now everyone can feel all the love you have to give.